Virginia Beach City Public Schools is pleased to provide you the 2018 Campus Compass, our Annual School Report Card. The purpose of this report card is to communicate to various audiences regarding educational accountability and to demonstrate our commitment to ensuring that every child is challenged and supported to reach his or her full potential. This report card includes information for the 2017-2018 school year related to school, staff, and student characteristics in addition to measures related to Compass to 2020. 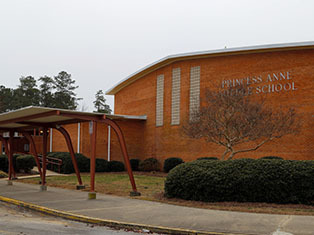 Additionally, performance data for this school that is required under the Every Child Achieves Act of 2015 is provided by the Virginia Department of Education and can be found on the School Quality Profile website (http://schoolquality.virginia.gov/schools/princess-anne-middle). Other general information about your child's school and all other schools in the division is available at www.vbschools.com. This graph displays the following results:, English '92'%; Writing '86'%; Math '89'%; History '95'%; Science '94'%.